Whether it's a simple red rose in a vase, a special breakfast, or a homemade card, girls love receiving small gestures on Valentine's Day. Daughters are especially appreciative when their father remembers how special the holiday can be for them. 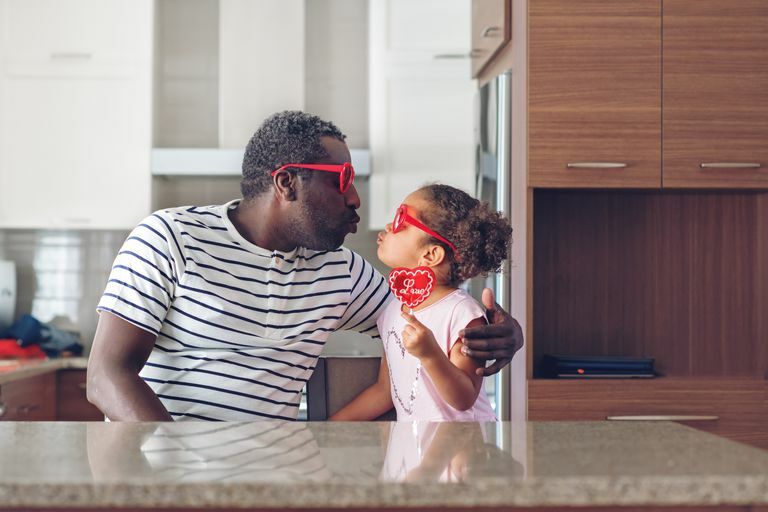 The bond that exists between a father and a daughter can grow even stronger when Dad puts something thoughtful together for her on Valentine's Day. Dads who make Valentine's Day cards for their daughters and granddaughters get rave reviews. Consider giving her a homemade card that communicates how much you care. Young girls, for instance, often enjoy old-fashioned Valentines that have lacy hearts, red construction paper, and a picture of the both of you together inside. Whether you want to make a Valentine's Day card from scratch or pick one out at the store, your daughter will appreciate a memorable card she can keep for years. Even if you don't consider yourself a crafty dad, you can still sit down with your daughter and make something fun together. There are many heart-related crafts to make, like a heart candy bouquet, heart necklace, or heart frame. For a candy bouquet, simply pick up her favorite treats and put them in a box or basket with some fun flair like red and pink bows and ribbons. You can also make a heart necklace together by wrapping white, pink, and red plastic pony beads and papers hearts on a string. If you're feeling more sentimental, make a heart frame by gluing hearts along with a cardboard frame and placing a photo of the two of you inside. If getting crafty isn't your thing, you could always play a game involving hearts, like bingo. If your daughter is at a school where she has a hall locker, drop in during the school day and decorate the outside of her locker. You can wrap it in red gift wrap, tape hearts all over it, or buy helium heart balloons and tie them to the locker handle. She will be excited to see the bright colors—and all her friends will know she has an awesome dad. If she doesn't have a locker, you can send a gift to her classroom or decorate her bedroom door at home. If you're feeling nostalgic, make your daughter a little heart-shaped tin with different notes in it about your memorable experiences from the past. Reminisce on family vacations, sports games, holidays, and more. This will remind your daughter of all the good times and how great of a dad you are to remember them. To make even more memories, take her on a classic date for Valentine's Day. Create a little date invitation, dress up, and take her out to dinner and a movie. For a more casual evening, go for pizza and bowling. The important thing is to spend quality time together. One tradition you can follow is to cut out red, white, and pink construction paper hearts and write the things you love about your daughter on them. Then, you can hide them around the house before your daughter wakes up on Valentine's Day. Put them in places she will find them, like in her bathroom cabinet, shower wall, shoes, school backpack, and more. When she finds each one, she'll be excited and may even look around the house for even more. Many girls love to socialize with their girlfriends. Hosting a Valentine's Day party for your daughter can be a lot of fun. Pick up some good treats, a fun movie, and plan some crafts for the evening. Like any other party, having board games, video games, and a cake can really make the celebration feel complete. Include some festive recipes like heart-shaped pizza and heart-shaped cupcakes to sprinkle in more love. In advance of the holiday, you could also make her bed, clean up her room, and hang up her laundry. Then, leave a card with hearts on it on her pillow, telling her that her Secret Valentine took care of her chores.